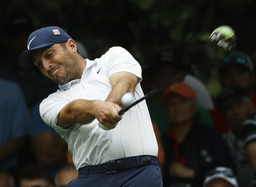 AUGUSTA, Ga. (AP) Francesco Molinari was gracious in defeat, despite losing control of the Masters following a wet and disappointing back nine. After playing rock-solid golf for 3+ rounds, Molinari flinched and errors opened the door for Woods - and others. Molinari hit his tee shot into the water at No. 12 and his third shot on No. 15 ended up wet as well. "I'm really happy of the way I felt out there," Molinari said. "I was calm, collected, never panicked - even after the first double bogey. I learned a lot of things today.